Road Angel Plus includes fully integrated GPS receiver and can operate independently using power from its internal rechargeable battery for up to 8 hours. The Road Angel Plus includes built-in laser detector. Road Angel Plus warns to blackspots, speed cameras (including Gatso, Truvelo, SPECS, Watchman, Speedcurb, DS2) and mobile laser guns via the laser detector; with an audible, visual and voice alerts. Road Angel Plus has been discontinued. Road Angel Plus is a cable-free device operating independently using power from its internal rechargeable battery for up to 8 hours. You can also power the Road Angel Plus directly from the cigarette lighter socket on your vehicle or from a USB port on a PC. The Road Angel Plus battery level is indicated by a five-bar metre on the left side of the display. The Road Angel Plus also is automatically set to conserve battery power by switching itself off if it is stationary for more than 10 minutes. The Road Angel Plus also includes built-in laser detector. If you break down and don't know exactly where you are, you can find your precise latitude and longitude co-ordinates at the press of a button on your new Road Angel display. This can then be passed on to your rescue service. The Road Angel Plus is capable of storing up to 50,000 unique speed cameras and identified accident blackpot sites. Updated and verified continuously by Blackspot Interactive, the central database can also be easily personalised. 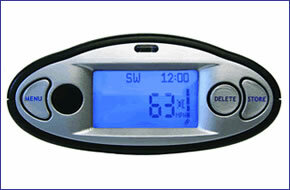 Also available is the GPS Road Angel Navigator which includes Road Angel Navigation as standard. The Road Angel Plus is easy to install using the provided suction cup and operates independently using power from its internal rechargeable battery for up to 8 hours. You can also power the Road Angel Plus directly from the cigarette lighter socket.